Virtuose and intimate, the aighetta quartet mixes shimmering tones … poetry comes out of the mutual listening, the remarkable sensitivty of this harmonious whole. … during their concert in the Carl-Orff-Saal in Gasteig, they sparked enthusiasm by defending the virtuoso school ardently;… they have a outstanding creativity. The most amazing with them is their tremendous coordinating ability, the perfect synchronization of the ensemble makes them a huge guitar activated by four hands in the glory of the instrument and the music. Each member of the ensemble is an exceptional soloist endowed with a sense of chamber music and with an intimate understanding of interpretation. Together they form a heart and a soul, and therefore master the more difficult pieces brilliantly. In spite of different temperaments, the four Monegasques, mingle into one play, sparkling with ideas. 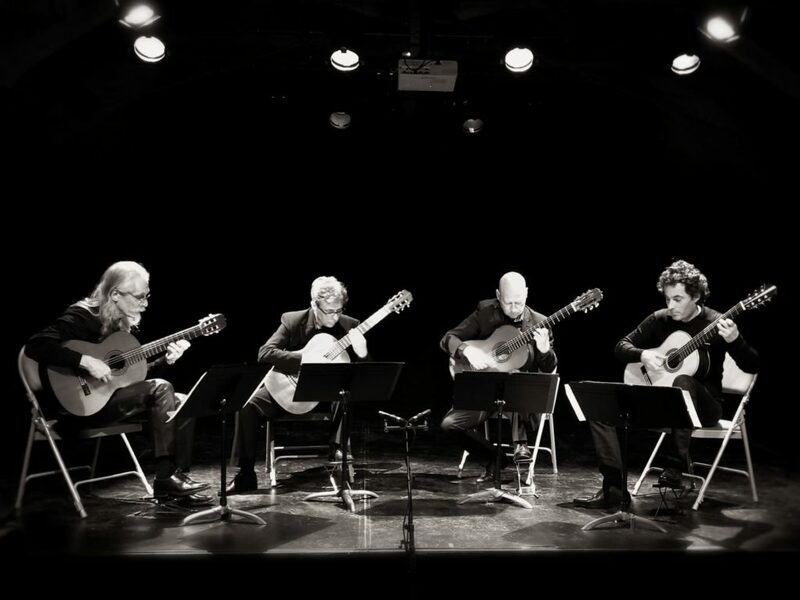 L’Aïghetta Quartett: Four virtuosi of very great worth, heirs to the school of Segovia, four individual personalities endowed with a fabulous collective spirit, who declared war on the guitar’s natural frontiers. Aïghetta Quartet: The twenty-four string guitar. With Aïghetta Quartet the music breathes, it is alive and remains precise, everything is easy, the guitar even with four players sounds perfect. In Monaco Aïghetta means Little Spring, yesterday concert remainded us the richflow of a river rather than to the promises of a little spring. It is a group that is well worth hearing. Unity is strength it is also delicacy! They have proved it with the Concierto Andaluz by Rodrigo.